Brad Friedel’s team is off to an 0-3-1 start. Motivation never seemed lacking for Brad Friedel during his career as a goalkeeper. 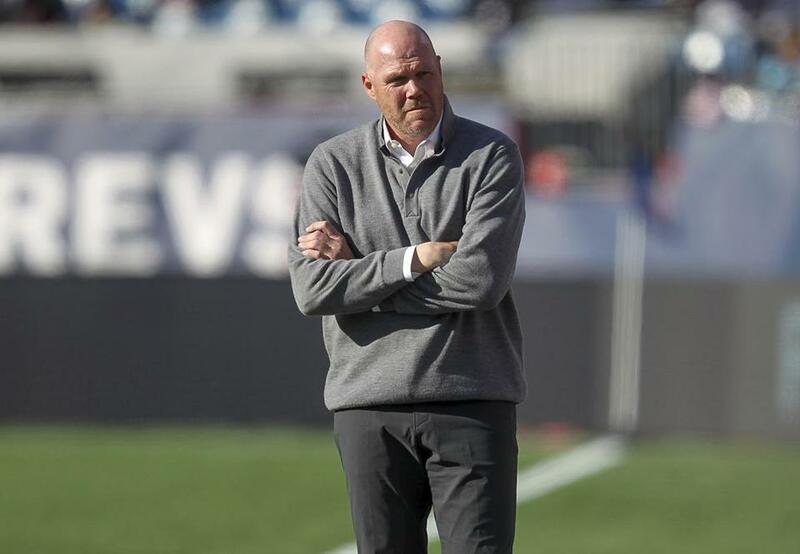 Bringing out the desire to succeed in his team has become a problem for Friedel as coach of the Revolution. Friedel called out his players for their performance in a 2-0 loss to FC Cincinnati on Sunday as the team’s record fell to 0-3-1. He also said the Revolution have had similar slow starts in most of their matches and pointed to MLS’s lack of promotion/relegation as a reason for players lacking winning mentalities. “First half, it’s really difficult to explain based on the week of training we had, the players that we know we have, and to see five or six not fighting as hard as the other team, that’s the worrying part,” Friedel said. “The good bit is you see them come back again in the second half. “The mentality of a player in this league, a lot of the players, when they lose, it doesn’t hurt enough. There’s not relegation, they don’t get fined, they don’t have fans waiting by their cars, they don’t have people beating them up. They don’t have the pressures they have in other leagues. Past Revolution teams appeared to be sufficiently motivated. Steve Nicol seemed adept at inspiring the Revolution. Jay Heaps, one Nicol’s most competitive disciples as a player, coached squads that often reflected his attitude. On a leaguewide basis, MLS teams usually seem prepared to battle to gain a result — despite the lack of promotion/relegation. Most games are played at a breakneck pace, with an emphasis on physicality. In many sports, that attitude, combined with conditioning, will usually keep a team in contention. The problem for MLS can be interpreted as players not knowing how or when to turn it on or tone things down. The league’s lack of sophistication gets exposed against Liga MX opposition, when the over-dependence on physical play gets trumped by skill, speed, and subtlety. Friedel also said the Revolution have committed funds to acquiring a Designated Player and are awaiting the player’s release from a European club. Until then, Friedel will have to figure out how to keep the Revolution, who play host to Minnesota United on Saturday, from sinking further. This is their worst start since going 0-6-0 in 2001. The Revolution’s game against Chelsea FC on May 15 is expected to attract one of the largest crowds for a match involving club teams in Gillette Stadium history. Of the stadium’s 18 soccer crowds of 50,000-plus, 16 were for national team matches. The two largest attendances for club matches were the 2002 MLS Cup between the Revolution and Los Angeles Galaxy (61,316) and Manchester United’s 4-1 win over the Revolution in 2011 (51,523). The Revolution are also expecting one of their largest crowds of the regular season (about 30,000) for a match against the San Jose Earthquakes on May 11. The Chelsea match will raise funds for several charities, according to Revolution team president Brian Bilello. The Blues conclude the Premier League season with a match against Leicester City on May 12 and are expected to arrive in Boston the next day. “Chelsea wanted to do it right after the end of the season, so they will have their first team here,’’ Bilello said. “There will be a few things we will do tied to anti-Semitism and hate that tie into the theme of the match. It seems unlikely that anyone would be willing to risk losing a player to a turf-related injury, but no decision has been made about installing grass over Gillette’s artificial surface. Chelsea has possibilities of qualifying for the Champions League via a top-four finish in the Premier League or by winning the Europa League. The Blues could be playing Europa League semifinal matches May 2 and 9 and also have a Premier League game against Watford on May 4. The Blues are facing several potential problems. Failing to advance to the Champions League would mean a significant loss of revenue and prestige. The Blues also could lose Eden Hazard to Real Madrid and are threatened with banishment from the transfer market through June 2020 because of Financial Fair Play violations. Chelsea owner Roman Abramovich has not attended at match at Stamford Bridge this season because of visa problems, and coach Maurizio Sarri’s status has not been confirmed while the team has fallen off the Premier League pace. Former Boston University and New York Red Bulls midfielder Michael Bustamante, 29, will be among the youngest coaches in the National Premier Soccer League when he guides Boston City FC this season. Bustamante, who replaces former Brazil national team star Palhinha, was a Globe All-Scholastic midfielder at Chelsea High School. He played for former Revolution defender Francis Okaroh with the Boston Bolts, then under Neil Roberts at BU. Bustamante had been playing for the Red Bulls alongside Thierry Henry, but sustained an anterior collateral ligament injury in 2014. Boston City opens its fourth season with a home-and-home series at Hartford City on April 27 and back on its home field, Harry Della Russo Stadium in Revere, on May 4.